The Supreme Court today fixed April 28 as the date for hearing the Centre’s plea seeking six months time to enable local bodies to conduct a “ground level survey” to identify roads and streets where mixed land use could be permitted. Solicitor General G E Vahanvati mentioned the issue before a Bench of Chief Justice Y K Sabharwal and Justice C K Thakker which fixed April 28 for hearing the Centre’s plea. The police are still clueless about the whereabouts of Ashok Rajput, owner of Delhi-based Iceberg restaurant who is suspected of murdering his female employee at MGF Mall here in the wee hours of Saturday. TV actress and main character in popular serial ‘Kyunki Saas Bhi Kabhi Bahu Thi’, Smriti Irani, addressed BJP activists who gathered to court arrest in Chandni Chowk today to protest against the sealing and demolition drive launched by the MCD. She was arrested by the local police but released later, a BJP official said. Addressing a public meeting after laying the foundation stone of Noida Authority’s new building complex in Sector 25-A here this morning, Samajwadi Party general secretary Amar Singh declared that the state government had modified its plan to set up the Dadri Development Authority on the pattern of the Noida Authority for the development of the Dadri region. Now, Dadri would be developed as Greater Noida Authority Phase II. A well-organised gang involving children, which decamps with cash and valuables lifted from various crowded spots, seems to be operating here. Two information centres opened by the Delhi Transport Corporation for the convenience of commuters at Wazirpur Bus Depot and Shalimar Bagh bus stand have been non-functional for more than one and half year, thanks to the apathy of the corporation. The All Haryana Power Corporation Workers’ Union has asked the state government to provide a government job to a kin of an employee of the Dakshin Haryana Bijli Vitran Nigam who had been killed after an assault on him in Ballabgarh sub-division recently. Delhi Finance and Planning Minister A. K. Walia has disclosed that revenue receipts in Delhi have gone up by 26 per cent in the year 2005-2006. The collection of revenue receipts touched Rs 8,939 crore in 2005-2006 whereas it was Rs 7,106 crore in 2004-2005. Vishwa Bharat Public School here in association with Policy Alternatives, Delhi, organised an International Outreach Programme last week on their school premises. Indira Gandhi National Open University has set up a Regional Centre at Port Blair. The Delhi Jal Board today denied media reports of a shortage of water in many areas of Delhi due to inadequate supply to the Wazirabad and Chandrawal water treatment plants. The New Okhla Industrial Development Authority (NOIDA) and NIIT have entered an agreement to revolutionise computer and computer assisted education in schools in Uttar Pradesh’s industrial district. The hearing on a petition filed by some local organisations here seeking lodging of a murder case against 11 people, including the erstwhile District Magistrate and Senior Superintendent of Police in connection with the Victoria Park fire here on April 10 could not be taken up today. Heavy clouds in the sky, coupled with cool dust storms, caused the mercury in the Capital to plummet to 34 degree Celsius, providing tremendous relief to the people of Delhi from the scorching summer heat. The Khurja police raided a closed down pottery factory here and arrested 64 Bangladeshis, including 48 minors and seven women, living there illegally after they crossed the Indian border stealthily. Two women were charred to death and one person injured in a fire which ravaged a slum cluster in North West Delhi early this morning. The Centre has also sought a direction to the MCD not to seal residential premises wherein commercial activities were being carried out during the six-month period. The Centre had moved the court on April 12 seeking directions to local bodies to complete the exercise of identifying mixed use roads and streets in residential areas within six months in a systematic and organised manner as per provisions of the Delhi Master Plan. “This request is being made genuinely in view of operational problems being faced by enforcement agencies, and the confusion prevailing in the minds of the residents and avoidable hardship likely to be caused to bonafide users of the mixed use policy,” the Centre had said in its application. Admitting “ambiguities and contradictions” in the matter of notification of the mixed land use in Delhi, the Centre had said it intended to set up an expert group of planners, architects and citizens to oversee the entire exercise and provide guidance to the local bodies. The apex Court had on February 16 directed the MCD to take immediate steps to seal residential premises being used for commercial purposes here. The Centre had also drawn the court’s attention to the Draft Master Plan of Delhi 2021, which prescribed maximum permissible ground floor, instead of restricting it to 25 per cent or 50 sq mtrs as in the Master Plan-2001, for commercial activities. This was done keeping in view ground realities and for easy, fair and effective implementation of the provisions as also to eliminate discretion by the field functionaries, it had said, adding the 2021 Master Plan was yet to be notified. It had clarified that the purpose of its plea was not to circumvent any order of the court in any manner “but only to suggest a reasonable, proper and lasting solution to problems genuinely being faced by all concerned sections of society”. On March 20, the MCD had informed the court that it had identified 189 streets of 80 ft or more width on which more than 50 per cent of the buildings were commercialised and said that action would be taken against all properties committing misuse irrespective of the extent of violation. On March 24, the Court directed MCD to commence sealing of the properties being misused from March 29 onwards if they did not file an affidavit before the civic body undertaking to remove their commercial establishment from the residential premises by June 30. On April 3 it extended the deadline for filing of such affidavits till April 7 and ordered that on filing of such affidavits commercial establishments already sealed be de-sealed and water and power, if disconnected, restored. 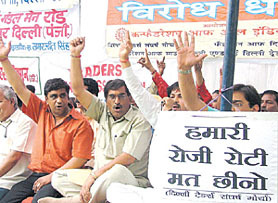 Meanwhile, the United Residents Joint Action (URJA), an apex body of RWAs in the Capital, has urged the government not to give blanket relief to traders as it would lead to chaos in the city. It also urged it not to issue any ordinance under pressure from the traders allowing the residential premises for commercial use. Station House Officer (SHO) of the DLF police station, where a criminal case has been registered against Mr Rajput, claimed the police had raided the residence of the accused in Janakpuri in Delhi, but in vain. Also, the police had made futile visits to his restaurant. Gurgaon police personnel had been deputed at his residence and the parents of the accused had assured all help to the law enforcing agencies to get him arrested, he added. According to the police, Mr Rajput had not gone to his residence or his restaurant after the incident. Two police teams, one for Gurgaon and one for Delhi, have been constituted for pursuit and arrest of the accused. Mr Rajput and his firm’s marketing manager, Ms Sonshi Javed, alias Soni Javed, were together in a late night party in a restaurant called Addiction, housed in MGF Mall here. They are reported to have had a verbal duel followed by a scuffle at the party. Later, they came out of the restaurant on the third floor of the mall when Mr Rajput allegedly pushed her from the third storey. The victim succumbed to her injuries in a nearby private hospital in the DLF area where she was admitted. The autopsy report said the deceased had consumed alcohol. Also, there was severe injuries to her ribs. The mother of the deceased, Ms Saira Javed, who is a resident of Urdu Bazaar near Jama Masjid in the Old Delhi area, had complained in the FIR registered by her that Mr Rajput had murdered his daughter. Her version is that Mr Rajput owed about Rs 1.5 lakh to her daughter. The deceased had come to Delhi from Mumbai the same ill-fated evening. The manager of Mr Rajput’s firm had brought her from Delhi to the mall. It is here that both of them had met after which the altercation between them started. According to Ms Javed, it was the manager who informed her that her daughter had fallen from the third storey of the mall. The police, for the present, have declined to give details of the follow-up action in the case on the grounds that it could impinge on the investigation, especially when the accused was absconding. According to sources, the Gurgaon police have alerted the Passport Department authorities to prevent the accused from leaving the country. Yesterday, the owner of Addiction restaurant, Mr Gurpreet, was arrested by the police under the Excise Act for running his business place after 12 midnight. He was, however, later granted bail by a local court. A total of 108 party activists, including seven women, were, however, lodged in Tihar Jail. Prominent among these are Abdul Rasheed, Suman Kumar Gupta, Virender Sachdeva, Dharam Vir Sharma, Sugan Chand Jain, Narendra chhabra, Harish Bharija, Virender Babbar, Mahendru, Siddhartha Sharma, Mohammad Imran Ismail, Renuka Gupta, Shahida Begam etc. The TV actress said that citizens of Delhi voted the Congress party to power with the hope that it would provide livelihood. But they had got adverse results. With the start of sealing of shops in residential areas, the industry and trade were being finished from the Capital, she said. The national secretary of the party, Mr Vijay Goel, said the DDA and the MCD should be dissolved immediately because both the institutions had failed to achieve their objectives and had become dens of corruption. Had these agencies worked with responsibility, this situation would have not come to pass, he said. Meanwhile, the MCD sealed 250 shops today, bringing the total so far to 4490 establishments. Mr Amar Singh said the Noida Authority had not only developed industry and other sectors but also taken care of the economically weaker sections such as slum dwellers who had just been allotted plots. This was only the beginning, Mr Amar Singh declared. “Prime Minister Mr Manmohan Singh and Union Finance Minister Mr P. Chidambaram only talk of the GDP for Tatas and Birlas. The Samajwadi Party has shown how to care for the poor,” he claimed. He said though farmers were being exploited as in Gujarat where the Narmada agitation was on, the Uttar Pradesh government had shown the way how to care for farmers. “Now onwards, all farmers contributing land for development will be given 100 per cent residential plots along with entrepreneurs and industrialists. And no more breaking the ‘abadi’ land here,” he declared. “The Centre and Delhi Government are destroying people on the pretext of court orders. Court orders can always be made ineffective by bringing forward ordinances. The Samajwadi Party will never allow such a situation in Uttar Pradesh as we have the majority in the Assembly and we can bring forward ordinances to counter the court orders,” he declared. “Noida and Greater Noida are fast catching up with Bangalore and Hyderabad and very soon Noida will replace Bangalore as the number one software centre in the country. People from Delhi come to shop in Noida. We are determined to beat Gurgaon in every respect. We shall be providing better facilities and infrastructure here to make Noida the first destination,” he said. He said he would try his best to make Noida a no-power cut zone again. “We shall bring a scheme for the benefit of kiosk and stall owners next month,” he added. Observers felt the Samajwadi Party general secretary had virtually kicked off the party campaign for the next Assembly elections by announcing many sops to slum dwellers, farmers, entrepreneurs and holding promises for the kiosk owners who should form a big chunk of the electorate. Speaking earlier, the chief guest at the function, Prof Ram Gopal Yadav, MP, said Mr Amar Singh had made an historic contribution to the development of the entire state but he was not popular with many people for his plain speaking. Speaking on the occasion, Chief Executive of the Noida Authority, Mr Sanjiv Saran, said the new office complex of the Noida Authority in Sector 25-A would be built on a total area of 9,500 sq mt and will be a six-storied building. It would have a total office space of 12,626 sq mt on all six floors combined with a basement of 7,476 sq mt and a parking lot for 200 vehicles. Designed by well-known architect Charles Correa and being built at a cost of Rs 45 crore, the new complex would be ready within 15 months, Mr Saran promised. A little later, a woman patient who was waiting for her turn at the clinic noticed that her bag containing cash and other items, was missing. As the matter came to the notice of the doctor there, the latter noticed the children moving on a rickshaw in Sector 11. As his suspicions zeroed in on the children about the lifting of the purse from outside the clinic, the accused tried to flee. While several persons, including some known to the physician were assembled there, a group of four or five person, who were ostensibly providing cover to the fleeing children, could not intervene and had to retreat in view of the large number of local residents gathered there. The children were taken to the nearby police chowki, where they admitted to their involvement in the incident. They also revealed that the cash lying in the stolen bag was thrown in a car parked outside the clinic to make a clean escape. “This is not the first such case. Many such incidents go unreported as the police hardly take any interest in purse lifting or snatching cases, which have become a routine affair,” said a local resident. Minor children aged between 10 to 15 years had been involved in a large number of such cases, especially when the driver was alone in the vehicle. A couple of years ago, a group of three children had lifted a purse and a bag from the car of a local doctor containing cash and valuables worth about Rs 1.25 lakh from the market of sector 16-A. The police could not recover the stolen cash and valuables. While the amount that was stolen and was later recovered due to the efforts of the doctor was just around Rs 700, a woman driving a car found the cash amount of about Rs 82,000 missing from the rear seat of the car when she stopped her vehicle after someone pelted something on her car while her vehicle had been stuck in a jam near the Sectors 8-10 crossing on Saturday. Someone lifted the moneybag when she tried to shoo away some children who threw something on her car. While the police were still to book a case in connection with today’s incident, it is reported that children and youth residing in jhuggis and slum clusters had been engaged in such activities. Several incidents of thefts, including the stealing of a large number of manhole covers in Sector 10 a couple of weeks ago, have taken place in various parts of the city. The Residents Welfare Associations of Sector 10 and 11 have demanded the removal of jhuggis and encroachment on the open plots and space in the area. Two information centres opened by the Delhi Transport Corporation (DTC) for the convenience of commuters at Wazirpur Bus Depot and Shalimar Bagh bus stand have been non-functional for more than one and half year, thanks to the apathy of the corporation. According to sources, both information centres had been opened about two years’ back to render detailed information about various facilities and services provided by the corporation. “The common people have little knowledge about various services provided by the corporation. For example, one can book a DTC bus for marriage ceremonies, picnic, tour, carrying students etc. Some buses are specially ferrying for ‘Dilli Darshan’ scheme launched by the corporation. Apart from this, one can obtain a daily green card pass from these information centres,” one of them said. According to the president of Bhrastachar Nirodhak Morcha, Mr Narendra Kumar Singh, the DTC was losing revenue every year. It was strange that it was winding up its potential revenue generating schemes. The Dilli Darshan Scheme was almost stopped. “The information centres were not only convenient for common commuters but they were beneficial for local tourists also. In the absence of these information centres, there is no other way for bus commuters to get information as to various services of the DTC. Now, the condition of these information centres is very deplorable. At the time of inauguration of these information centres, colourful display boards had been put up for information about various services of the DTC. Now, these display boards are gathering dust in absence of proper upkeep,” he added. When contacted, a senior officer of the DTC said that they were aware of the situation. “We are now facing shortage of manpower. To run these information centres, we need some specialised officers, specially those who have some experience and expertise in public relations. We hope both the centres will be restarted very shortly,” he commented. The All Haryana Power Corporation Workers’ Union has asked the state government to provide a government job to a kin of an employee of the Dakshin Haryana Bijli Vitran Nigam (DHBVN) who had been killed after an assault on him in Ballabgarh sub-division recently. The union has demanded release of all benefits to the victim’s family that are normally given to the kin of those killed on duty. Mr Subhash Lamba, general secretary of the union, said here today that the employee, Dhayandass, working as UDC, had been assaulted by a local resident on April 10 last, which resulted in brain hemorrhage and later death of the victim. The incident had taken place while the employee was on duty in the office and doing his routine official work. Claming that it was a case of gruesome murder, he said the accused was assaulted in a brutal murder and this led to the victim falling unconscious immediately as he was hit on his head by a solid object. He said while the police should immediately add Section 302 of the IPC in the FIR, the state government, he said, should ensure the safety of the employees by setting up a proper system and channel of attending to the public complaints and grievances so that any employee should not become the victim of such an attack in future. He said as Dhayandass had lost his life on duty the government should take action to absorb a kin of the victim in the Nigam or any other department on compassionate grounds as the employee was the only earning member of the family. The union has also appealed to the government to fill the backlog of vacant posts in the Nigam as, it claimed, there was a serious shortage of employees, which include both field and office staff to handle the workload, that had gone up several times in the past two to three decades. It has also demanded opening of employment on ex gratia basis in the state and regularising hundreds of employees in each of the division. Dr Walia said the maximum increase of 52.43 per cent was recorded in taxes on vehicles followed by 45.72 per cent in other taxes and duties on commodities and services, 25 per cent in VAT, 23.84 per cent in stamps and registration, 21.47 per cent in state excise and 12.63 per cent in taxes on goods and passengers. He said this had become possible only because of trader-friendly and pragmatic economic policies of the Government of Delhi. Dr Walia said the financial position of Delhi Government was much better today as compared to the past seven years. The Delhi Government had decided to repay loan amounting to Rs 6,000 crore which was not being utilised presently. It was being charged an excessive amount due to interest on loans and had been requesting the Union Government to stop releasing its share out of small savings. The amount of Rs 6,000 crore also related to share from small savings. An amount of Rs 20,000 crore had accumulated as loan from this head. He added the city government would continue persuading the Union Government for accepting early repayment of the loan amount. Vishwa Bharat Public School (VBPS) here in association with Policy Alternatives, Delhi, organised an International Outreach Programme last week on their school premises. The programme was organised to create an institutional capability for policy advice and generate a sense of international cooperation to tackle human problems from the global point of view. Policy Alternatives, a non-partisan, public research institute, had created a platform for the parents, teachers and students of three schools to come together for developing a shared understanding. The schools that participated were Archway School, Stroud, United Kingdom, Jaindera School, which functions for marginalised community at Surajkund, Haryana, and VBPS Noida. After a formal welcome, the teams were escorted on a tour of the host school followed by Saraswati Vandana. A presentation on the history and achievements of the school was followed by a presentation and speech by Dr Mondira Dutta, Director, Policy Alternatives, and Mr. Rajan K Zutshi, Network Manager, Policy Alternatives. The students were later involved in group activities such as rangoli and graffiti competitions on the topic ‘Go Global’. The winners were selected by a team of judges. A colourful and musical cultural programme was put up by the students of the host school that included Kathak dance, Jugalbandi, Haryanvi and Bhojpuri folk songs and Holi and Kashmiri dance. A few indoor games such as musical chairs and “Queen of Sheeba” also entertained the young gathering. Gifts were presented to the visitors by the host school. Dignitaries like Dr B. Zutshi, Secretary, ISCA, Ms Vivian Warren, former Head, Archway School, and members of the Managing Committee of Vishwa Bharati Womens' Welfare Institute were also present on the occasion. Prof S. S. Ambardar proposed the vote of thanks while concluding the formal meeting. Ms Vivian Warren thanked the hosts and said that she earnestly hoped to see students go hand in hand into the future making the world a better and a safer place to live. Indira Gandhi National Open University (IGNOU) has set up a Regional Centre at Port Blair. Study Centres have been set up in four islands, one each at Middle Andaman (Rangat), Little Andaman (Hut Bay), Car Nicobar, Nancowry Group of Islands (Kamorta) and Great Nicobar (Campbell Bay). The Andaman and Nicobar Administration, has provided built-in space for the Regional Centre Building. The university’s VC Prof. Dikshit informed that to extend the facility of EduSat connectivity in the islands of Andaman and Nicobar, steps have been initiated by ISRO to provide C-band network so as to enable different islands to receive the national transmission of IGNOU on education. This will enable learners living in far-flung areas to receive lectures through the programmes transmitted from Delhi. The facility is expected to be ready by August 2006. IGNOU has also been using interactive radio for transmitting its programmes under its Gyan Vani FM Radio initiative. The university has set up a network of 17 stations and 9 more stations are in the process of being commissioned. Efforts are also being made to set up Gyan Vani Station at Andaman to benefit the learners and general community at large. The university has also extended its MoU with Foreign Service Institute (FSI), Ministry of External Affairs, for another two years. An agreement to this effect was signed by Mr. Rahul Kulshrestha on behalf of the institute and Mr Dapil Kumar Tetri, Registrar, IGNOU. As part of the MoU, IGNOU has developed Virtual Campus Website for mid-career training programme of IFS officers who are based in all parts of the world and have transferable jobs, making it difficult to provide face to face training. As per the MoU, information technology-based distance learning programmes have been developed which are available to the diplomats at their place of posting. The contents for training modules and evaluation strategies are provided by FSI while IGNOU has the responsibility of transforming these into a web format apart from administering the website. On-line classes are scheduled to start from April 24, IGNOU officials informed. He admitted, however, that production at the two water treatment plants had been slightly hit for a while due to the DJB lifting water from the Yamuna for its Bhagirathi Plant, rather than due to Haryana’s inability to supply water to the river. “However, after I wrote a letter to the Chief Engineer of the DJB asking him to desist from lifting water from the Yamuna for the Bhagirathi plant, the situation was back to normal and remains so,” the SE said. Media reports today claimed that fall in the water level in the Yamuna to 673.90 ft had affected water production at the Chandrawal and Wazirabad plants, thus leading to a water crisis in parts of Central, South and North Delhi. At a function here today, Prof Kiran Pal Singh, Education Minister, Government of UP, and Prof Ram Gopal Yadav, MP, Samajwadi Party, flagged off the programme at Government Junior High School in Noida’s Challera Village. As part of this initiative, NIIT will use its vast education delivery expertise to teach computers and subjects using computers to students of Classes 6 to 8 in 10 government schools to start with. Mr Sanjiv Saran, CEO, NOIDA, highlighted how the region was being promoted as a global IT hub and a step like this would enable the preparation of crucial manpower resources required for the knowledge era. NIIT’s holistic computer education programme is designed to enable computer and computer-assisted learning at school level. Due to lack of adequate evidence, the court adjourned the hearing till tomorrow. 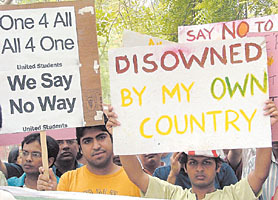 The petition, filed in the court of the Additional District and Sessions Judge (II) Rajesh Kumar by the All India Lawyers Union and the Hindu Yuvak Mahasabha, seeks prosecution of senior officials, including the then District Magistrate Ram Krishan and Senior Superintendent of Police Rajeev Sabbharwal and the organisers of the Trade Fair. The petitioners alleged the district administration and police utilised bulldozers at the scene of the inferno and destroyed evidence. A similar petition has also been filed in the Allahabad High Court. Meanwhile, traders here have demanded compensation from the district administration for the losses suffered by them in the fire. The traders said they had got all the goods on display insured, but due to the destruction of evidence, they have not received any compensation. Businessmen who suffered losses warned of an agitation if they did not receive relief. The clouds and dust storm also led to a drop in minimum temperature to 18.6 degree Celsius from 20.4 degree Celsius yesterday. For the first time over the last fortnight, Delhiites, who have been experiencing scorching heat since the last week of March, today woke up to an overseas sky. The cool weather brought about by the dust storm and the heavy clouds came as a welcome relief for the people of Delhi, who have been experiencing temperatures upwards of 38 degree Celsius during the last week of March and the first week of April. The decrease in temperature today is a continuation of the trend of a fall in mercury in the Capital over the last one week. Ever since a squall, which began on the evening of April 9, plummeted the mercury from 40.4 degree Celsius on April 9 to 36 Degree Celsius on April 10, cool winds have been bringing about a consistent drop in mercury. From a high of more than 23 degree Celsius on April 10, the minimum dropped to 19.5 degree Celsius on April 11. Subsequent days saw a further drop to 17.6 degree Celsius. The relief in weather is likely to continue tomorrow with the weather office forecasting a partly cloudy sky, with thunderstorms and dust storms in Delhi. They have also predicted a high-speed squall in some areas. The police and intelligence agencies are interrogating the arrested Bangladeshis. SSP N. Pawaja had learnt about these persons three days ago. She had alerted the LIU which confirmed that a group of Bangladeshis were hiding on the premises of the closed Madina Pottery on the GT Road. They were nabbed by a special team on Sunday morning. They said they had come from Faridpur district of Bangladesh. Instead of Kotwali they were taken to the Dehat police station for better security. Sleuths of the LIU, intelligence agencies and the police are interrogating them to understand their reason for their having crossed over to India illegally. Their criminal antecedents are also being verified. They said they had been living here for a month after crossing over to India. A junk dealer, Rafique, is learnt to have brought them to the pottery factory. The police are questioning the pottery owner and Rafique. Fire Department officials said Ahilaya (60) and Zarina (22) were killed in the fire that broke out at around 1.30 am in Balaswar slum near Jehangirpuri. One Kasur Ali sustained minor injuries and was taken to a nearby hospital. According to Fire Department officials, the fire broke out in one of the shacks and soon spread to the adjoining ones, catching the inmates by surprise. Most of them were asleep at that time. They said around 25 shacks were destroyed in the blaze. The fire was controlled in about 30 minutes by 20 fire engines. The cause of the fire is yet to be ascertained. Congress MLA and Chairperson of the Delhi Commission for Women (DCW) today sat on hunger strike at Yusuf Sarai Market in protest against the sealing drive. Today was the fourth day of relay hunger strike for which Mr Subhash Chopra, MLA and former president of the DPCC, and Mr Parvez Hashmi MLA and AICC Secretary, had given the call against the sealing of shops. Mr Santosh Kumar Kain, a retired Indian Police Service (IPS) officer of the 1970 batch, has taken over as member of Delhi Government’s Public Grievances Commission. The post had been lying vacant since March 25 when Mr Gautam Kaul vacated it, an official statement said today. Mr Kain was earlier Special Commissioner of Police (Security and Administration) in Delhi Police. He recently retired as Director General of Indo-Tibetan Border Police.